You make a good point but seem to miss mine. Crowdfunding was a way of making the event happen and getting the set done at minimum risk. It's not like those of us who participated weren't going to get anything from our investment - if the project didn't get off the ground we lost nothing as our money would be refunded (as happened with previous crowdfunding efforts). BUT - if HaT went through all the trouble of reproducing this set a second time after the previous FUBAR and for whatever reason there wasn't demand enough to defray expenses they would lose their investment. I really can't blame them for playing it safe and crowdfunding any project. I couldn't blame them if they went the crowdfunding route from here on out, but I also see the limitations for truly growing their company and market. But no one is holding a gun to anyone's back and forcing them to participate in any crowdfunding effort. You are welcome to sit back and complain from the comfort of your keyboard about this or that set not being available. I don't know all the why's and wherefores of why HaT crowdfunded this or that set; I do know I'm glad they did to make this set available and I am happy to help make it possible; and I will certainly enjoy the sets I helped crowdfund when they come in. They will be kind of special to me because I feel I had a sense of participation in the process - something we don't get too often. We have always paid their costs. We have always paid the costs of the other manufacturers. When you buy a set from a retailer part of the the purchase price is to recoup the cost of manufacture. crowdfunding just pays for the manufacturing costs up front. 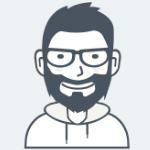 Why is HaT using crowdfunding? That was explained here on the HaT forum (or, perhaps, on the old forum), most people here are aware that due to unavoidable circumstances HaT ceased production for aouple of years. This lead to complaints from customers about the amount of time they had been waiting for sets so HaT decided to open a second line of production which was funded by crowdfunding In order to get through the backlog a bit quicker. It should be noted that most of the manufacturers making our figures are not huge corporations with unlimited resources but one or two people who either outsource production or cast the figures themselves. For these types of opperations I imagine that production costs of each new set have to be paid for by sales of the last one so, if a second line of production is to be opened, where does the money come from? HaT's answer to that question was crowdfunding. If any economic genius out there has a better solution we would all love to hear it. HaT is still producing figures in the normal way, they are also producing some extra sets via crowdfunding. In the case of these two sets it should be noted that the sets have already been made but due to an error at the factory they were made out of scale and it was decided to sell them as 28mm sets. Some of us here, on this forum, asked HaT to please remake them in 1/72 and to use crowdfunding if that's what it would take to get them done. It seems to me that by crowdfunding the Penisular War light and heavy dragoons HaT is just giving us what we asked for. How Dare They! P.S. Re Pommeranian Piccolo Players, I"M IN!. Well said, sir - much better done than I. Status: Sizing figures in process. Now if only the Bonus Figures could be Officers. 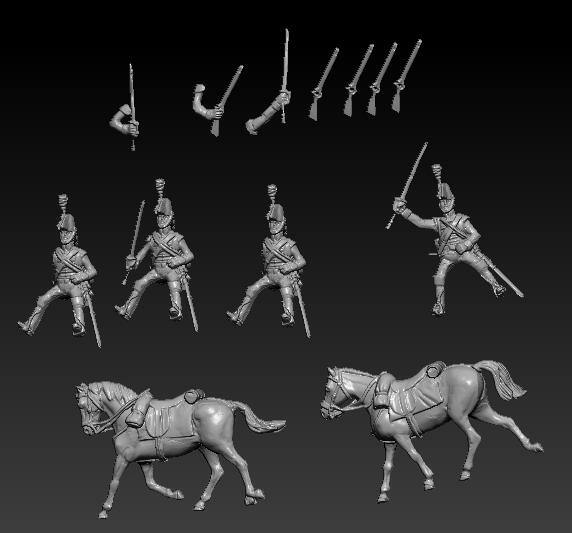 In anticipation of the British Dragoons I have just placed an order for more Airfix British Hussars and RHA, and Hat Brunswick Infantry. I already have the Hat Spanish and all the French you could shake a stick at. The Peninsula campaign will be a welcome change to the 100 days. 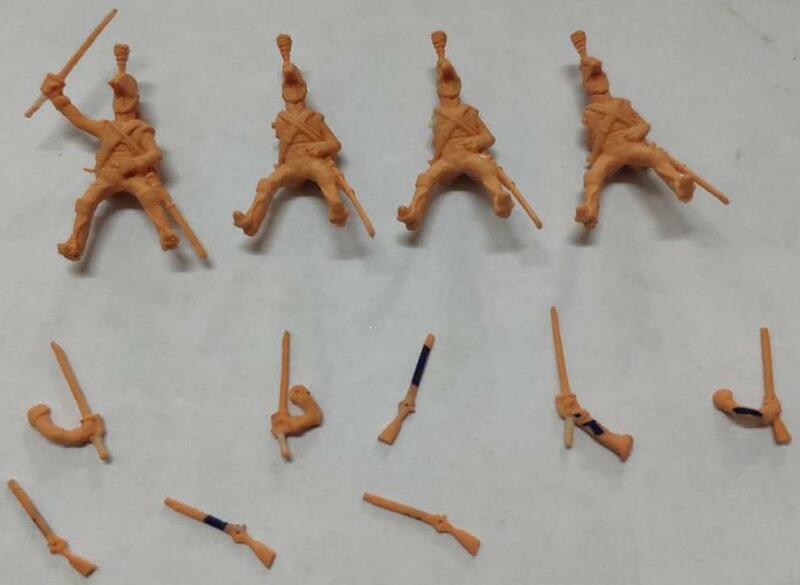 On an unrelated note I have also bought some more Hat Austrian Cuirassiers and Foot Artillery. When can I see the release of the Hat Austrians in helmets? For crowd funders of these sets (me included) will there be any exclusive figures? If so is there any possible list of suggestions? Finally, when is production expected to begin? Figures are nice enough but HAT should have included some other heads with the 'caterpillar' crest helmet and standard late war dragoon helmet. These figures aren't wearing the correct uniform for those helmets though. And HaT does already have a set of dragoons in the dragoon helmet (with the correct uniform). Caterpillar crest helmets might have been useful but they would have to be sized to the other set with the post 1812 uniform. Wondering if you have an approximate delivery date for these 2 sets? We will update status as we proceed to the next stage. Right now, it seems that sizing is satisfactory and we will go on to the next step of tooling. so i think that i could find the brit dargoons in 3-4 months on the shops. Since the production time table is still at stage 9, I suggest that anybody with a sense that these figures could be useful should board the Crowd Funding band wagon now to take advantage of the immenent release with the added advantage of receiving the Bonus Figures. Whilst it would be good to see these figures released in true 1/72 scale, I'm afraid that I'm 'out' so far as crowdfunding is concerned. Simple economics mean that the relatively small number of boxes that I would need mean that each figure would become just about the most expensive anywhere amongst my Napoleonic armies. 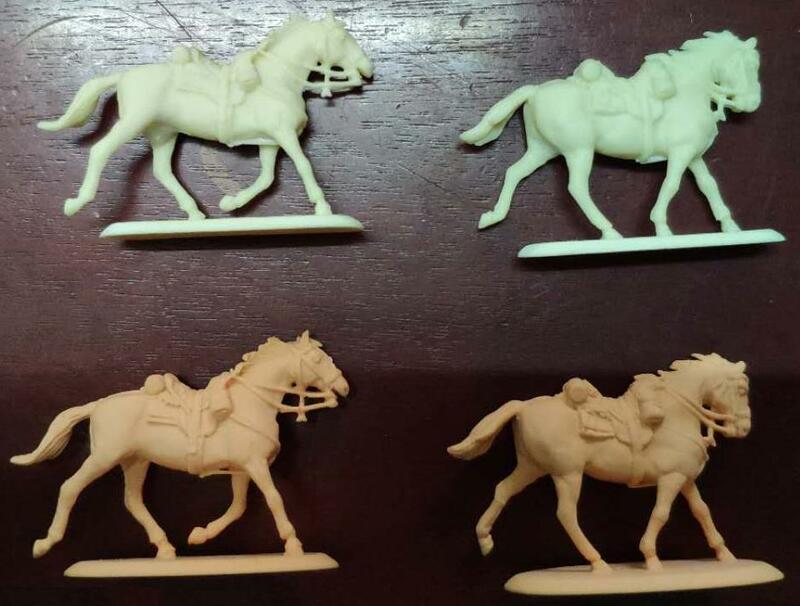 Cavalry in the Peninsular tended not to be numerous and the figure to real ratio I use for Napoleonics is 1:30....hence, 1,000 actual cavalry equates only to 32-34 figures, barely 3 boxes. British/KGL, and most especially KGL, cavalry might be good...but not that good. More generally, is it still HaT policy to crowdfund some future sets? I've also noticed very little movement in the crowdfunding scorecard over recent months, suggesting perhaps that this is now a dormant product development and marketing approach?? 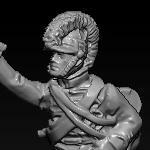 These Light and Heavy Dragoons are the only time that I have got involved with crowd funding. On my order I included an extra box of Light Dragoons just for the chance to convert them into mounted rocketeers to use alongside Hat´s Rocket Troops. 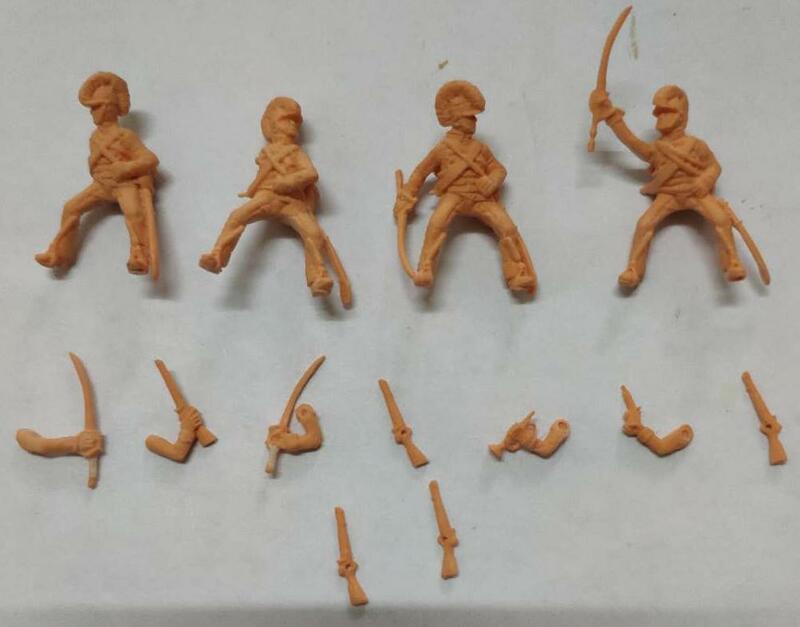 Depending on the final size of the figures these will be teamed up with either Airfix RHA limber or Revell RA limber. 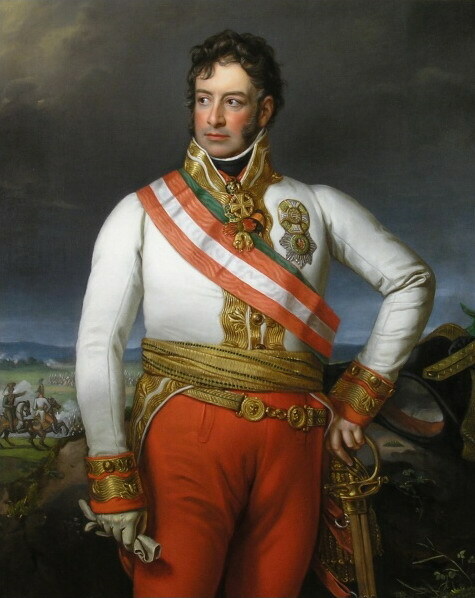 I haven´t looked through my Napoleonic reference books in a long time but I suspect that the Heavy Dragoons may be similar to other similar cavalry of another nation. Didn´t the heavy cavalry of the Dutch/Belgian forces fielded at Waterloo have a regiment in bicorns? According to the excellent 'centjours.mont saint jean' website the 1st and 3rd Dutch Carabineers did wear bicornes during the 1815 campaign. This is also shown in Lachouque's 'Waterloo', page 33. 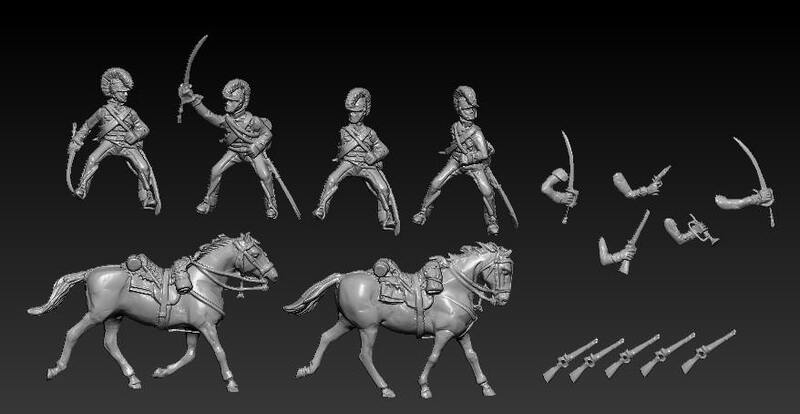 Using the light dragoons as RHA riders is definitely a good extra use for the forthcoming figures...a very good idea! 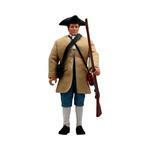 Sorry, should have added that the Peninsular heavy dragoons do look potentially good for Dutch Carabineers circa 1815. I'm not sure that the horse furniture is quite right though...maybe these riders on French dragoon horses would work well? Definitely starting to get psyched about these figures; I try to pace myself. Is it too late to get involved in the crowdfunding on this? If so, how do I sign up! 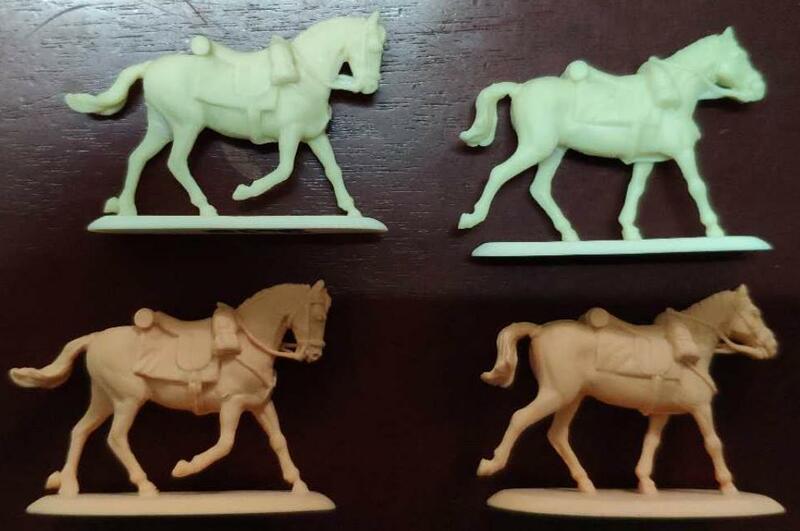 I purchased a few sets of HaT Peninsular infantry on a whim last week after reading Rifleman Harris' memoirs.. couldn't see any existing early Nap British cavalry so hit the jackpot here! Good news, and they look great. I wonder if I can increase my crowd funded pre-order?